Just made a couple loaves for the household, and I'm trying the addition of a little olive oil to relax the dough for better shaping. Keeping the dough cool (room temp cool) seems to help with structural integrity during the proofing. We'll see if the olive oil even affects the flavor of the bread, or the longevity. 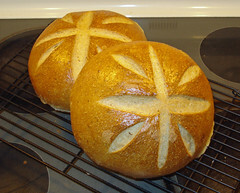 It's been weeks since I did basic boule loaves, feels good to be in the groove again.